A Barrier references multiple widgets as input, and creates a virtual guideline based on the most extreme widget on the specified side. For example, a left barrier will align to the left of all the referenced views. Other widgets can then be constrained to the barrier itself, instead of the individual widget. 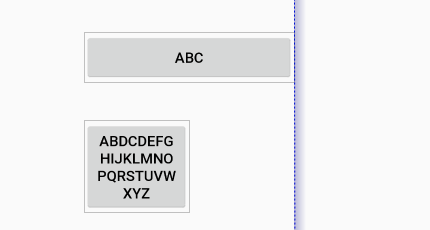 This allows a layout to automatically adapt on widget dimension changes (e.g. different languages will end up with different length for similar worlds). If the barrier references GONE widgets, the default behavior is to create a barrier on the resolved position of the GONE widget. If you do not want to have the barrier take GONE widgets into account, you can change this by setting the attribute barrierAllowsGoneWidgets to false (default being true).